Greensboro, NC. (Aug. 17, 2009) International hunger relief organization Feed The Children is pleased to announce two-time U.S. Open Golf Champion Lee Janzen will host a food distribution at Greensboro Urban Ministry Food Bank, 305 W. Lee Street on Tuesday, August 18 at 3 p.m.
Feed The Children and Lee Janzen remain committed to helping children in need throughout America during this economic downturn. Feed The Children, working with local partner agency Greensboro Urban Ministry Food Bank, will provide a box of food and a box of personal care items to recipients. The boxes are designed to help supplement a family for up to one week. Janzen has won eight times on the PGA Tour, most notably the 1993 and 1998 U.S. Open. In 1993, Janzen defeated Payne Stewart at the Baltusrol Golf Club in Springfield, New Jersey, en route to tying the 72-hole U.S. Open scoring record of 8-under par. Five years later, Janzen again bested Stewart to win his second U.S. Open, this time at the Olympic Club in San Francisco. 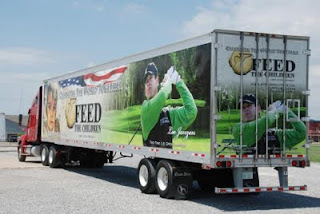 Founded in 1979 by Larry and Frances Jones, Feed The Children is consistently ranked as one of the 10 largest international charities in the U.S., based on private, non-government support. Feed The Children is a Christian, international, nonprofit relief organization with headquarters in Oklahoma City, Oklahoma, that delivers food, medicine, clothing and other necessities to individuals, children and families who lack these essentials due to famine, war, poverty or natural disasters. In FY 2008, Feed The Children distributed more than 133 million pounds of food and other essentials to children and their families in all 50 states and internationally, supplementing more than 760,000 meals each day. Since its founding, the organization has reached out to help those in need in 118 countries around the globe. For more information, please visit www.feedthechildren.org.